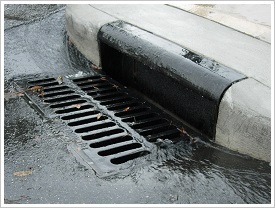 Stormwater is water that is created during various precipitation events such as rain, snow, hail and sleet. As it flows, it picks up debris, chemicals, dirt, and other pollutants. Anything that enters a stormwater system is discharged untreated into our streams, lakes, washes, retention basins, and parks. Eventually this water can find its way into our groundwater and impact our drinking water. Polluted runoff is the nation's greatest threat to clean water. The stormwater management program is responsible for managing the quality of stormwater. This may include management of flooding, erosion control, and minimizing the discharge of pollutants into the environment. Pinal County has a Stormwater Management Plan approved by the Arizona Department of Environmental Quality. This plan was approved in 2006 and is available for download at the link below. This plan was put in place to protect water quality as part of the Clean Water Act. Pinal County staff inspects construction sites for compliance with each site's Storm Water Pollution Prevention Plan (SWPPP), educates the public and businesses on stormwater pollution controls, and investigates illegal dumping of wastes that can impact our stormwater. Never dump anything into the streets or down the storm drains. Pesticides, herbicides, pet wastes, leaking fluids from a vehicle, or household chemicals could all end up in our washes, streams and retention basins if proper care is not taken. For questions or to report illegal dumping or discharges into streets, storm drains or washes, please call (520) 509-3555. Erosion control is the best. Prevents soil from eroding. Rolled products fiber often used. Erosion control sometimes is not feasible because it may be easier to trap eroded soil particles before leaving project site than to prevent them from eroding in the first place. For example, during construction of a roadway, one may install a silt fence along the Right-of-Way at wash crossings while rough grading is underway. It would be impractical to prevent erosion while the contractor is performing earth work. Sediment control is a temporary control measure. Just keeps sediment from leaving the site. Silt fence is the best example. Often installed incorrectly with poor backfill and/or compaction. A failure on any part of the system, makes the silt fence fail completely.